You're aware of the benefits of yoga for fitness, but practitioners also use yoga for concentration—it's been shown to improve focus, attention, and memory. Hatha yoga is a mixture of meditation, breathing exercises and postures. At some point, you may have attended a yoga class with a close friend or family member, thinking it would be a fun way to spend quality time relaxing and releasing stress from a hectic work week. However, did you know practicing yoga can accomplish a lot more than that? Researchers have found that yoga can greatly affect neural patterns in the brain, which can improve your ability to concentrate and focus. The benefits of yoga for concentration can potentially apply to just about any task that comes your way. Yoga has become a popular stress reliever and physical activity in recent decades across North America. Its origins come from ancient India. The development of yoga can be traced back at least 5,000 years, and some researchers think it may even be 10,000 years old. In the late 1800s and early 1900s, yoga masters began traveling to the West, which attracted attention and followers. Slowly but surely, yoga centers started to open all around the world. In addition to Hatha yoga, other types of yoga as a form of exercise became particularly popular by the early 2000s in North America. Today, yoga takes many forms, from the most common type (Hatha) to “hot yoga,” where participants are encouraged to sweat up a storm in temperature-controlled rooms to remove toxins from the body. This process takes place as you move from pose to pose. Other forms of yoga include “goat yoga,” where daring individuals attempt to focus on their postures as baby goats jump around the room! Let’s look at the top three brain-related benefits you can achieve when you practice yoga for concentration. Cognition and memory. Researchers at the University of Illinois found that just eight weeks of Hatha yoga improved cognitive functions within the brains of elderly individuals with sedentary lifestyles. The participants improved significantly on tests that simulated important every-day tasks. Overall, the study’s findings suggest that practicing yoga a few times a week can positively impact your body’s response to stress as well as your cognitive abilities. The same researchers shifted their focus to the impact of Hatha yoga on memory and inhibitory control. From completing a 20-minute yoga session, participants showed noteworthy improvement in memory, speed, and accuracy. Improve your focus and attention. 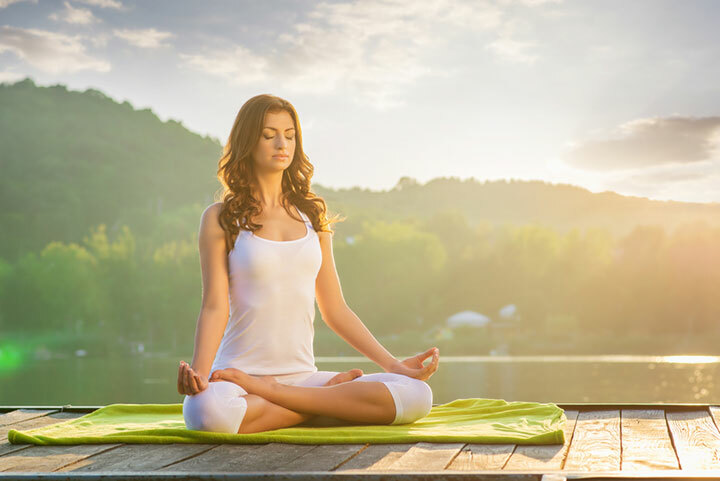 Research published in the Journal of Cognitive Enhancement found that the meditation used in various forms of yoga successfully improved the attention and focus of participants, including those of older ages. After just three months of consistent meditation and yoga, participants in a UC Davis (University of California, Davis) study showed improved brain function and focus. After several years, participants were shown to maintain certain cognitive functions. The University of Waterloo also found that yoga can shift attention, allowing you to better focus on purposeful tasks. After just 10 minutes of meditation via yoga, researchers found that stress levels were reduced and focus was drastically increased in anxious individuals. In particular, individuals with ADHD may want to consider yoga for concentration along with myriad other benefits. Improve Your Energy and Reduce Anxiety. Another research group at the University of Waterloo found that Hatha yoga greatly increased the energy levels of participants, further aiding in their ability to focus and improve brain function. The success of Hatha yoga in increasing energy levels comes from the release of endorphins and increase in blood flow as you practice posing and breathing exercises. The study’s results also suggested that yoga can reduce the presence of anxiety and other negative emotions that can cloud judgement and impede healthy cognitive functions and attention. Research focused primarily on the effects of both yoga and meditation, finding that while both played important roles in boosting energy levels, Hatha yoga in particular was far more successful. Overall, the study uncovered that with only a few minutes of yoga each day, you can boost your brain’s cognitive functions to control emotional responses and goal-oriented behavior. adhd, anxiety, boosting energy, boosting energy levels, brain, breathing exercises, chronic fatigue, chronic fatigue syndrome, chronic fatigue syndrome treatment, chronic fatigue treatment, endorphins, exercise, fatigue syndrome, fatigue treatment, health, immune system, improve brain function, increasing energy, lack of energy, meditation, memory, mindfulness, physical activity, reduce anxiety, stress, studies show, toxins, yoga for beginners, yoga found effective for pregnancy anxiety.